Believe it or not, but I had set up a pretty strict release schedule for my books: one new title every six months. It took me a while to realize, I’m self-publishing—I can launch books whenever I want! Having novels come out more or less frequently probably isn’t going to hurt me. Heck, a lot of indie authors make books available for preorder before the book has even been formatted/edited/written. At least, that's the goal of Dr. Peter Cork's research. The reality, though, is that he's barely getting by. Stuck in the isolated town of Last Chance, Colorado, he lives in a trailer which doubles as his lab. His funding has been cut, his fellowship is ending soon, and mysterious earthquakes keep ravaging his equipment. Naturally, none of the students who have been sent to work as his research assistant are willing to stay. Peter's last hope is his newest intern, Grace Hudson. If she chooses to leave, instead of sending a replacement, his department will immediately shut down the entire research project. He would have picked anyone else. She's spoiled, moody, bossy, and—worst of all—she couldn't care less about geology. I really wanted to write something that showcased the realities of pursuing a career in academia. Of course, I also had to add some sci-fi flare with laser drilling and a ton of research into plate tectonics. The heart of the novel is the growing relationship between Peter and Grace, but if you’re looking for a romance, you’ll be disappointed. 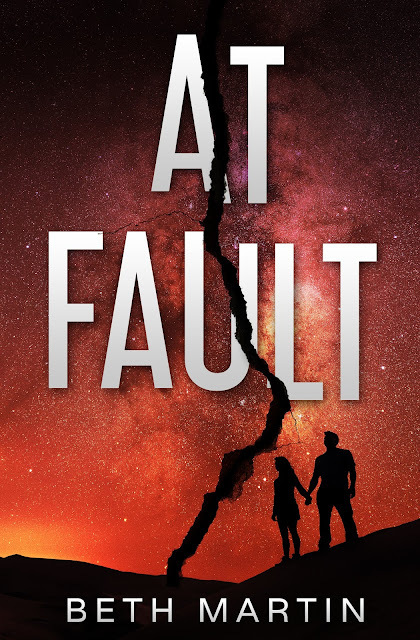 If you can’t wait to read At Fault, well, you don’t have to! The paperback version is already available here. The eBook will release on July 3, 2018. If you’d like a reminder on the eBook launch day, make sure to sign up for my newsletter.